Immunogen: Synthetic peptide corresponding to aa 9-18 of GLP-1. Scientific Background: Glucagon-like peptide-1 (9-36) amide and GLP-1 (9-37) are the forms of GLP-1 which result from rapid degradation of the active forms of the peptide (GLP-1 (7-36) amide and GLP-1 (7-37)) by the enzyme dipeptidyl peptidase-IV (DPP-IV, also known as CD26 or adenosine deaminase binding protein). GLP-1 is a peptide hormone of the glucagon family, produced by the L cells of the intestinal mucosa from the same prohormone as glucagon. The active forms are potent stimulators of glucose-dependent insulin secretion. The sequence of GLP-1 is fully conserved in all mammalian species examined so far. 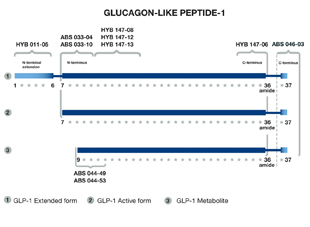 Figure: Schematic glucagon-like peptide-1 (GLP-1) showing active, extended and metabolite forms along with select GLP-1 monoclonal antibodies.